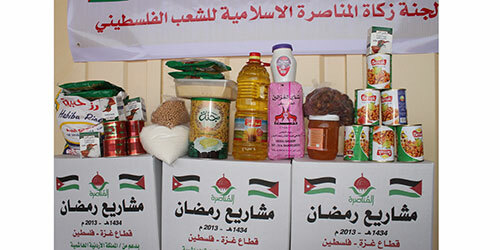 Food Aid Project is carried out throughout the year, specially in the holy month of Ramadan where it contains the most important food types. The value of the Food Aid Package is JOD 50, which is almost USD 70. 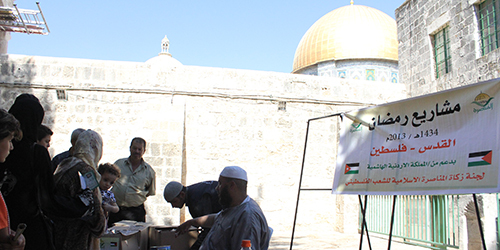 We are the AL Monasara Islamic Zakat Committee for Palestinian People founded in the Hashemite Kingdom of Jordan upon a generous initiative of some businessmen and people of charity. Having obtained a license by the Jordanian Ministry of Awqaf and Islamic Affairs on 16/05/1990 under no. 7/3/2/926, AL-MONASARA had an aim to offer support and assistance to the Palestinians in the West Bank, Gaza Strip and Jerusalem. يتم تنفيذه على مدار العام وخاصة في شهر رمضان المبارك حيث يتم توزيع طرد غذائي يحتوي على أهم أصناف الطعام اللازمة . قيمة الطرد الغذائي 50 دينار مايعادل 70 دولار امريكي .